There are dozens of lighthouses up and down the coast of Maine including four that are in Portland, a short 30 minute drive from Kennebunkport. It’s worth taking a day trip to view these maritime beauties. Lighthouses in Maine and elsewhere have become less essential to navigation, but rather than have their historical structures face demolition or neglect, the United States passed the National Historic Lighthouse Preservation Act of 2000, providing for the transfer of lighthouse structures to local governments and private non-profit groups while leaving the maintenance of high intensity lights and lenses to the United States Coast Guard (USCG). Additionally, many of the lighthouses have been placed on the National Register of Historic Places which ensures their ongoing protection. Portland Head Light, in existence for more than 200 years, is the oldest lighthouse in Maine and was the first completed after our independence from Britain. Its mission then and now is to guide maritime traffic through the entrance to Portland Harbor. Local merchants began petitioning for a lighthouse as early as 1784 but it took a maritime tragedy in 1787 to get Massachusetts legislature (Maine was not a state at that time) to provide $750 to begin construction. Later, in 1790, President George Washington authorized Congress to take over the responsibility of all lighthouses. 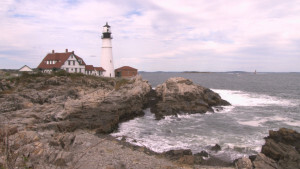 Portland Head Light was given $1,500 to finish the 58 foot tower of rubble stone set in lime. In 1865, the tower was raised another 22 feet, making Portland Head Light an 80 foot tower. The lighthouse had keepers until it was automated in 1989. Set along the cliffs within Ft Williams Park, this is a beautiful location to walk along the paths and take in the beauty of the Maine coastline. The west side of the main entrance to Portland Harbor is the location of Spring Point Ledge Light. It was built in 1855 after numerous ships met their end on the rocks of Spring Point Ledge, a name given from a spring that once flowed from the nearby bank. Later, when a Braque (sailing ship) Harriet S. Jackson wrecked, residents recommended the construction of a 5th order Fresnel lens and foghorn. Spring Point Ledge Light is located on the breakwater at Southern Maine Community College in South Portland. During July and August the lighthouse is open to visitors on Saturdays and Sundays, except for July 26 when they hold the Annual Tri-For-A-Cure Race. There are some restrictions when visiting the lighthouse, such as height and shoes. Those who are shorter than 51” are not allowed to climb the steep ladders to the top. Also, because the iron decks can be slippery, bare feet and flip-flop shoes are not allowed. Another Portland lighthouse is Portland Breakwater (Bug Light), built in 1855, replaced in 1875 and automated in 1934, it is now inactive. It is, however, listed on the National Register of Historic Places. The most recent restoration of the lighthouse was completed in 2002, along with a newly built park that surrounds the lighthouse. It is called Bug Light Park. Ram Island Ledge Light, located offshore from Fort Williams Park in Cape Elizabeth, can only be reached by boat. During high tide the rocky ledges in that area were hidden with many boats smashing themselves on the rocks. For that reason Ram Island Ledge was built in 1905. The light was converted to solar power in 2001. It provided power for two large batteries supplying light and fog signal. The lighthouse was put up for auction in 2009 and is now privately owned.